The above is part of the publisher’s blurb for the book that fol­lowed many of Tamar Myer’s two won­der­ful­ly fun­ny and clever cozy mys­ter­ies. 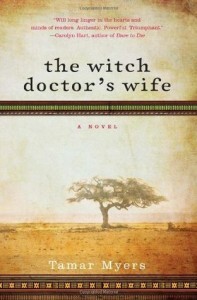 I read The Witch Doctor’s Wife about five years ago, before I joined Goodreads, before I had a blog, and, mainly—before I began review­ing the books I read. How­ev­er, I remem­ber it fond­ly, so you know it has stay­ing pow­er. I did inter­view Tamar for the Sis­ters in Crime blog. I remem­ber a cou­ple of answers from that inter­view. For one, she had a com­put­er ded­i­cat­ed to writ­ing, with no games or inter­net access. (That’s one I real­ly, real­ly should fol­low.) Also, she said she didn’t write the story—it was already writ­ten. All she did was ask the Uni­verse to deliv­er her dai­ly por­tion of cre­ativ­i­ty and it did. She then sat down and wrote a thou­sand pol­ished words a day, five days a week. Inci­den­tal­ly, she has writ­ten more books in that series, as well as con­tin­u­ing the cozy series. In fact, she has a four-page Ama­zon author page. For a taste of Tamar’s fun, I would sug­gest read­ing the acknowl­edg­ments in Death of Pie. No def­i­nite Blog Sched­ule but I’ll try to post some­thing of inter­est to writ­ers each week, pos­si­bly on Sat­ur­days. Sign up to get these blog posts by email below.